Enjoy Clean Air and Soothing, Germ-Free Moisture in Any Large Room with This Top-Rated All-In-One Air Cleaner Humidifier! Here We Offer The Best Combination Electric Evaporative Wick Humidifier & Filterless Air Purifier That Quietly Removes Dust & Odors and Relieves Allergies & Asthma in Homes, Big Offices & Shops to 860 Square Feet, All at a Discount Price with Free Shipping! Cleans and Humidifies the air, with no white dust. Built-in digital humidity meter or humidistat, which allows you to perfectly set the the humidity levels that's best for you, between 35 & 65%. 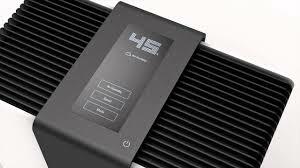 Four Operation Modes: Automatic, Sleep, Timer, and Clean modes: Automatic--regulates fan speed depending to maintain humidity level; Night mode--slower fan speed for quiet operation and dimmed lights; Timer mode--set the unit to run for 1-8 hours then shut off; Clean--for easy maintenance of humidfying discs. Quiet--as low as 27dB(A)--about half of the sound of a human conversation. Robert offers portable dust & odor removal, best allergy & asthma relief & quiet germ-free evaporative wick humidification in homes, offices, rooms & shops. Dry air and airborne allergens & pollutants in homes and offices are the main causes of most allergy and asthma symptoms. To fix this problem, most people will need to buy both a quality portable room air purifier and an electric humidifier, which can be expensive. And if you buy a quality air cleaner and evaporative humidifier, you’ll probably have two sets of filters or wicks to replace, as well, which can get expensive, too. 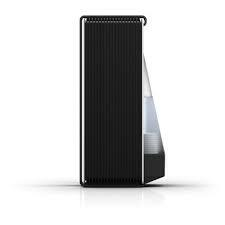 Stadler Form’s latest innovation ‘Robert’ combines an air cleaner with an evaporative room humidifier, with large room capacity up to 860 square feet (big enough for almost any home or office), and easy portability since it weighs only 18 pounds. This humidifier released a cool mist of water, as well, which makes it safe for use around babies, children, & pets. Best of all, this electric ‘air washer’ is filterless, which immediately saves you time and money because you won’t be changing filters all the time. Robert draws dry, dirty air through the water in the unit, removing common dust, pollen and other allergens and pollutants, then the humidifier ‘wheel’ with washable filter wicks on its surface rotates through the water and with a high quality fan releases a clean, purified cool mist of moisture and air back into your room. Robert also has an easy-read digital humidity meter or ‘humidistat’ so you can set the exact level of humidity that keeps you breathing easy, and any allergies or respiratory issues under control. 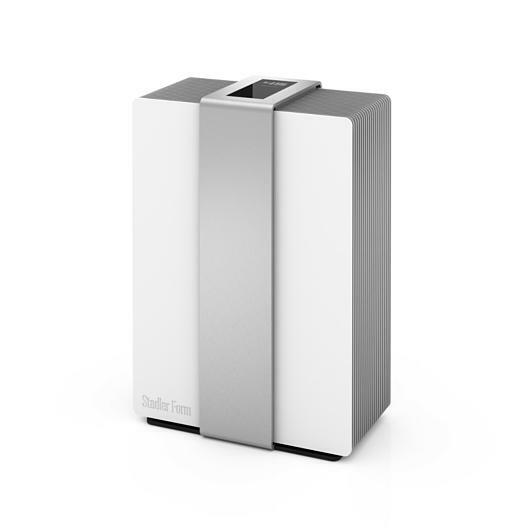 For added safety and health benefits, Robert also includes the Stadler Form Ionic Silver Cube to continuously kill any mold or bacteria that might try to pollute the water in the humidifier reservoir—so that all you get is clean, cool moisture in any room of your home or office. 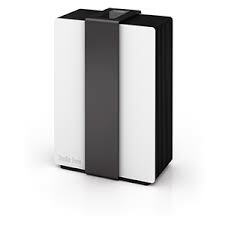 The Silver Cube lasts for 1 year, as well--not just a couple of months as some humidifier brands’ silver cartridges do. Robert also features Stadler Form USA’s state of the art ‘motion sensor’—just wave your hand over the top of the unit to engage different functions! Robert is also aromatherapy capable! Just add your favorite fragrance to the room with the optional fragrance dispenser. This humidifier – air cleaner also features an auto shut-off, a self-cleaning mode for easy maintenance, automatic and night modes, and 4 speed or output levels. Check out the video below to see more about how this amazing ‘air improver’ works. 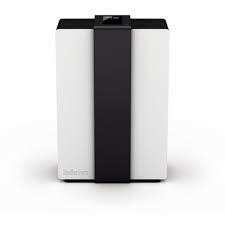 Robert very new, but it’s already being labeled as one of the “best new indoor air quality innovations on the market”. So if you’re looking for a quality large room evaporative humidifier that is quiet safe, and effective, with the dirt & odor-removing power of an air purifier, there’s only one choice—Stadler Form USA’s Robert Air Washer. Order yours today and feel the difference clean, perfectly humidified air can make! Air Purifiers and Cleaners.com is #1 on the web for the best air purifiers, cool mist evaporative humidifiers, whole house air filtration systems, and many other quality products—all at the cheapest discount prices with free shipping, every day. We sell cheap and ship fast due to our low overhead and great relationships with suppliers. And if you have any questions, before or after the sale, our experts are always available—just give us a call toll-free at 1-800-701-2513. We’re here to help! Type: Air Cleaner with cool mist evaporative humidification, no white dust.